‘The Dandelion Years’ By Erica James | An honest book review. This was my first book written by Erica James – and it certainly won’t be my last. Erica James beautifully juxtaposes two romantic stories from different eras, one modern, one from World War Two. The link is Jacob, an old man living alone in an old country house in Suffolk with his huge collection of books; on his death, his young friend Matthew inherits the house, and Saskia is brought in along with her father Ralph to sort, value and sell his books. The initial meeting between Matthew and Saskia is not overly successful – and then the first notebook of two is discovered. So begins the true story of Kitty, and surprisingly, Jacob, penned by Jacob himself about his life in Bletchley Park during the Second World War. There is a lot of sadness in The Dandelion Years; Saskia’s family life is sorely tainted by tragedy in the loss not only of her mother, but also of her two grandmothers in the same accident that claimed all their lives. The father and grand parents have made a home together for her, but the lack of a female presence in life is always present. Matthew on the contrary has never known his father, hence his relationship with Jacob which fulfils the filial role, until his death. Through the story of Jacob and Kitty’s growing love for each other, Saskia and Matthew grow closer, and there is a distinct feeling that the lost opportunities with the historical lovers should not be repeated! This was a powerful story of love and loss which I thoroughly enjoyed. Erica James does not rush her stories but builds them artfully so that the feeling of romance and poignancy, sadness and promises, lingers on after the book is finished. 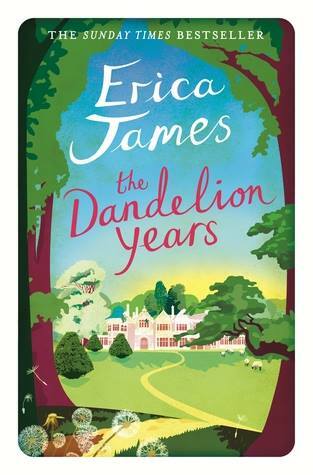 I will be reaching for my next Erica James book very soon!